Composition shingles, by far, are the most popular product installed on steep slope applications. In fact, it makes up 58% of the entire residential market. These products are proven performers that last long and give the homeowner exceptional value with warranted life expectancies from 20 to 50 years and are backed up with the highest UL Class A Fire Rating available. Your home is probably the largest asset you own, which makes your roof one of the most critical systems protecting your home from the harsh elements of the Pacific NW. We offer an array of composition products from ultra high end designer shingles, to basic architectural shingles, to budget base three tabs. Cooper Mountain Roofing is certain we have a product to fit your needs and your budget. 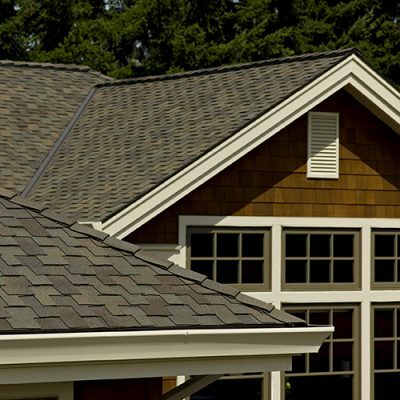 Cooper Mountain Roofing is a CertainTeed Select shingle roofing company. This is the highest level of achievement a roofing company can earn. To achieve this, all our applicators have demonstrated and earned the designation of Master Shingle Applicator. Having a Credentialed workforce allows us to offer all of CertainTeed’s “Sure Start Plus” warranties assuring you the roof will be completed properly the first time.